Ten days ago it started raining, and it rained for three days, almost non-stop. In 48 hours we received 170mm rain, almost half our annual average! On Landmeterskop we had to quickly dug furrows above the dams to get some of the runoff water away from our already full dams. In spite of the bad weather, our guests still had a good time – relaxing and resting, and fortunately for the children there was the thrill of helping with the milking of the goats and the feeding of the lambs! The entrance to Landmeterskop Farm. 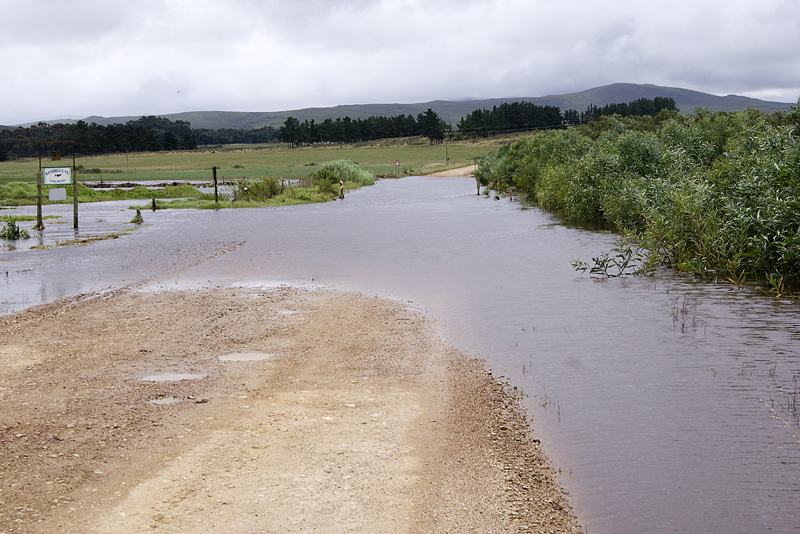 And on Sunday, with many of the roads closed due to heavy flooding, we had to try and find a road which would be safe for our guests to use, as they had to get back for work Monday morning. 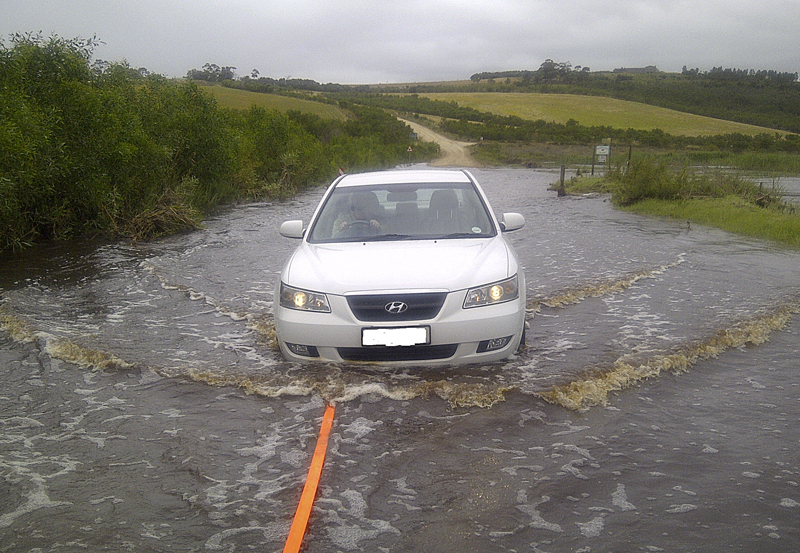 And with a little precautionary help from Theunis (as you can see in the photo), they all made it home, safely. 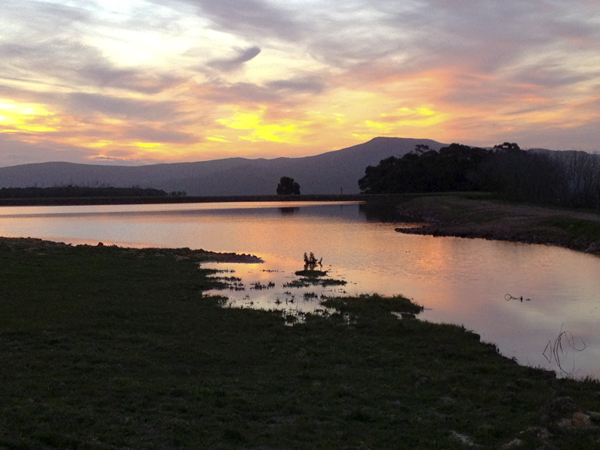 Quack, quack, quack… there is new sound on Landmeterskop! 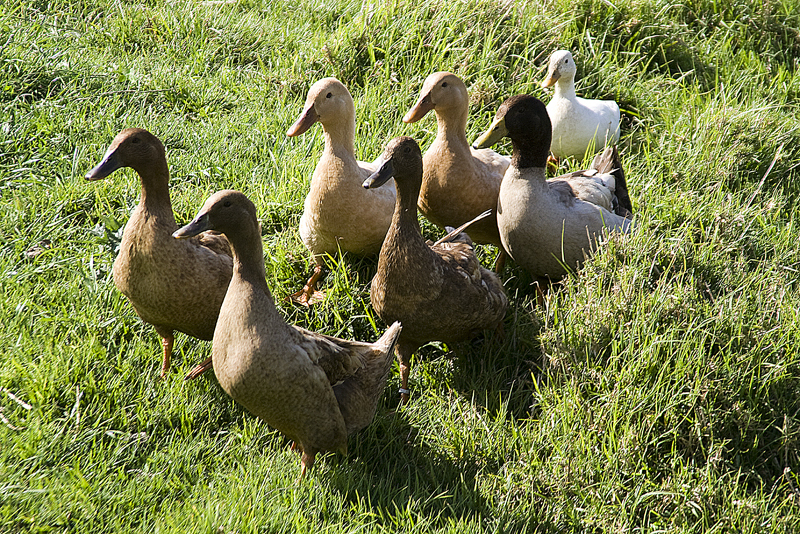 Yes, there are now also ducks roaming around the pond nearest to the Homestead – Khaki Campbells, Buff Orpingtons and Dutch Quakers! And more will shortly join their ranks. The Khaki Campbell (or just Campbell) breed of domesticated duck was developed by Adele Campbell of England and introduced to the public in 1898. Adele Campbell purchased a Fawn and White Indian Runner Duck which was an exceptional layer (195 eggs in 197 days) and crossed it with a Rouen Duck in an attempt to create a strain that would lay well and have bigger bodies. The offspring were crossed with Mallards to increase their hardiness. The resulting birds were prolific layers. But, Mrs Campbell was still not satisfied with the colour and in an attempt to create a more attractive buff-coloured duck she crossed her original Campbells with Pencilled Runner Ducks. And voilà! A duck which colour reminded Mrs. Campbell of the Khaki-coloured British Army Uniforms! The Buff Orpington duck is a dual-purpose breed of domestic ducks used for meat and egg production. It is capable of laying up to 220 eggs a year. 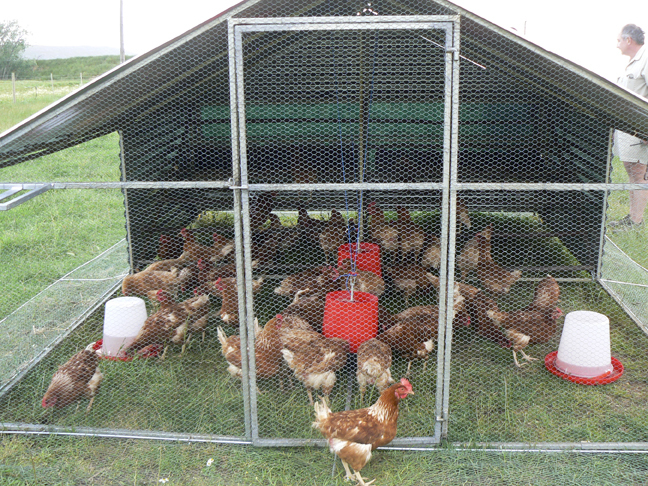 They were originally created by William Cook, a famous poultry breeder from Orpington in Kent, England, and was introduced to the public in 1897. Cook was also the developer of the Orpington Chicken. 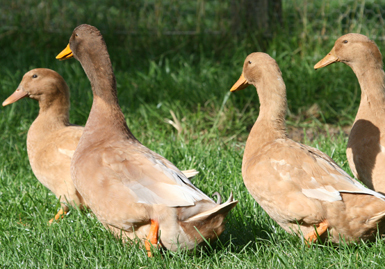 Cook blended Cayuga, Runner, Aylesbury, and Rouen ducks to create a buff coloured duck that would allow him to cash in on the early 20th century English fad for buff-colored plumage. This first duck was called a Buff Orpington and Cook went on to develop Blue, Black and Chocolate Orpington versions that had white bibs on their chests. The Buff, as it is commonly known, is a long, broad bird with an oval head, medium length bill, and long, gracefully curved neck. It’s body carriage is twenty degrees above horizontal, its wings are short and it has a small, well-curled tail. Both the duck and drake have buff plumage, orange-yellow shanks and feet, and brown eyes. The drake’s bill is yellow while the duck’s bill is brown-orange. 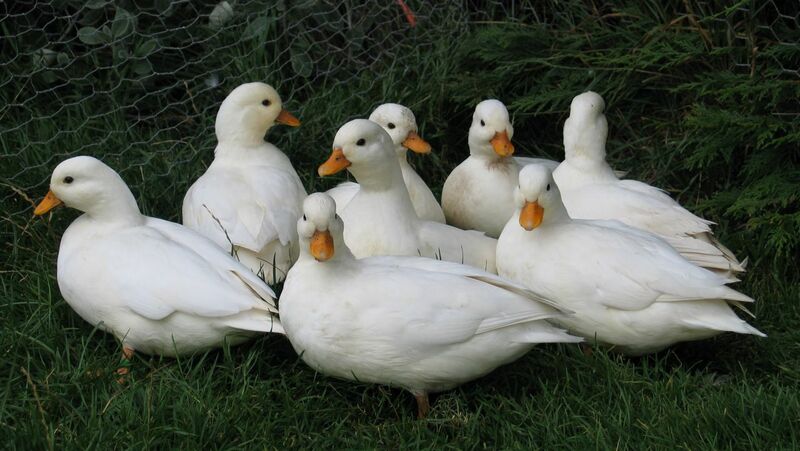 The small white Dutch Quacker Duck or Call Duck is a bantam breed raised primarily for decoration or as pets. They look similar to Mallards, but are smaller in size. The first recorded mentions of the breed are from the Netherlands where it was used as a decoy and known as a Coy or Decoy Duck. The high-pitched distinctive call was used to lure other ducks into funnel traps. Later, hunters would tether Call Ducks to draw other species within range of the guns. It is believed to have originally come from the Far East, although no records of its introduction to the Netherlands exist. Just like us humans, ducks have personalities and each duck has its own little habits. 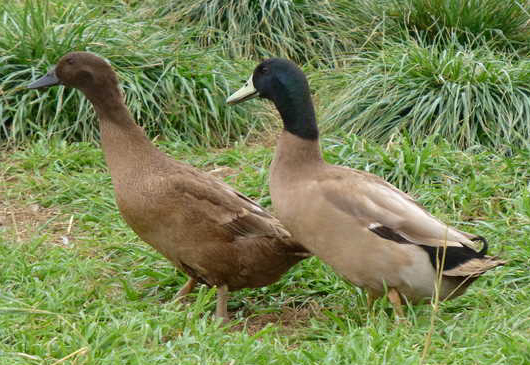 They talk to each other by quacking – the female duck (hen) has a loud “quack”, while the male (drake) has a raspy quack. The peaceful coexistence of the flock is regulated by the law of “Pecking order” – the number 1 bird in the flock can peck and dominate all the others, the number 2 bird can dominate all but the number 1 bird, the number 3 bird can dominate all but 1 and 2, right on down the line until we reach the last bird who dominates no one. All ducks forage for food. They dabble and tip up in shallow water, drilling in mud to get the goodies. which mainly consists of seeds, berries, fruits, nuts, bulbs, roots and grasses. Ten percent of their diet consists of insects, mosquito larvae, snails, slugs, leeches, worms an occasional fish or tadpole. Sand and gravel are picked up to serve as grinding stones in the gizzard. Ducks thrive under harsh conditions with limited shelter, resist diseases and parasites, and produce food efficiently. Not only are ducks beautiful to look at, but they can also make one laugh with their little “mannerisms”, especially during mating season! Ducks prefer to mate on water, but most do well on land. During “courtship” the drake’s head may be bobbing up and down, as if to say, “Hey, your cute, how about a date?” Then he would bite and/or pull the back of the hens neck feathers, and stand on the hen’s back dunking her head in the water, as if he’s trying to drown her! 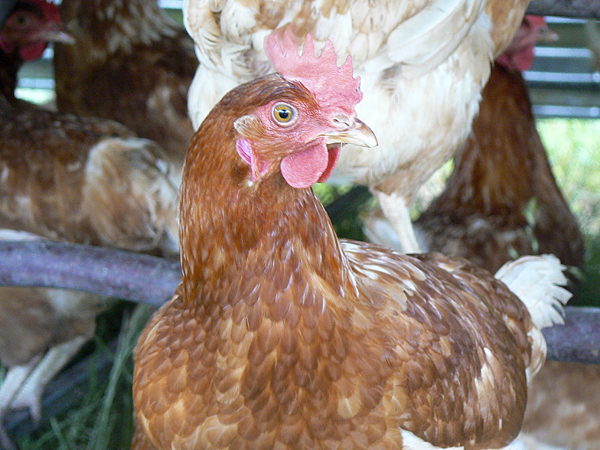 Although drakes may have a favourite hen, they normally will mate with any hen in the flock. They lay eggs at random on the ground, and sometimes even while swimming. When a nest is made, it is a shallow depression in the ground, lined with twigs, grass and leaves. 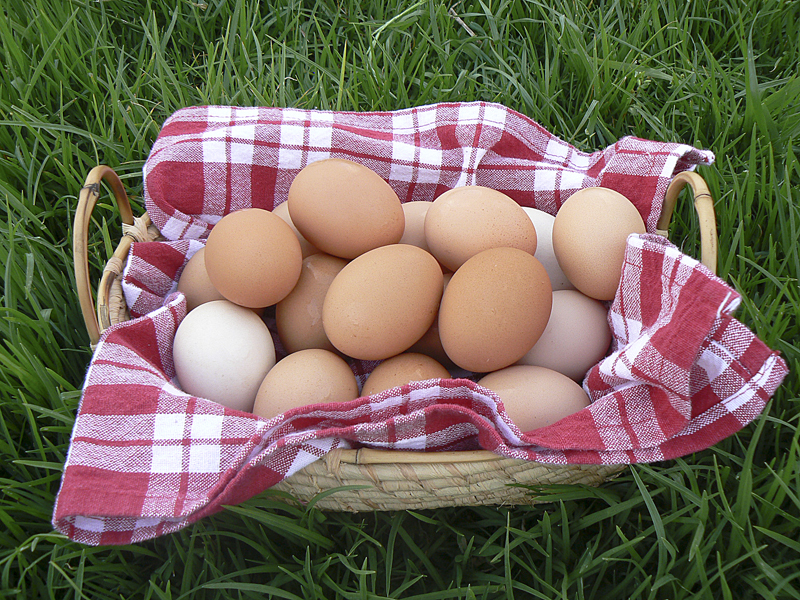 If eggs are left for natural incubation, the hen will pluck down from her breast for additional insulation. If the ducks have a house with straw, hay or some type of bedding in it they may make their nest there. Several times a day, ducks preen and oil their feathers using a feather conditioner from a hidden oil gland located on the top of the tail base. As they preen, they squeeze the oil gland with their bills and spread it onto the feathers. Contrary to popular belief, this oil does not “waterproof” a duck nor it’s ducklings. What does then? The way their feathers are structured! Each feather has a main shaft, or rachis, that supports the whole structure. While the feather is growing, the rachis has blood vessels within it that carry nutrients to the growing parts of the feather. When mature, these blood vessels die and the rachis is sealed at the base, leaving the feather shaft hollow. This helps to make the feather very light. Branching off the rachis are barbs. These barbs each have branches called barbules, and the barbules have branches called barbicels. These three parts make up the vane of the feather, which gives the feather its “feather-like” shape. The barbicels are very tiny, and you’ll need a good magnifying glass or microscope to see them. They are generally hook-shaped, and interweaved with each other. They hold the vane of the feather together, sort of like Velcro or a zipper. If you’ve rubbed a feather the “wrong way” and then smoothed it back to its original shape, what you’ve done is unhook and re-hook the barbicels, like “zipping it back together”. The barbicels can hold the feather vane together so tightly that water cannot go through. And this is what actually keeps water off a duck’s back, not the oil they apply to their feathers. In fact, the oil is only used to keep the feathers clean and in good condition, not to coat them for “waterproofing”.